The NYS Gaming Commission has disclosed the training death of 2-year-old Escape to Vegas Saturday at Belmont. He was coming off his first race. Also, 5-year-old Quake in My Wake “broke down” (Equibase) in the 10th yesterday at Parx. “Broke Down,” of course, is Racing’s euphemism of choice for dead. These deaths cannot be justified, cannot be defended and are utterly UNACCEPTABLE. Racehorses are being sacrificed at the rate of about 24 deaths each week and the racing industry carries on regardless as though it’s not an issue for them. The fact of the matter is that they have a critical animal welfare issue on their bloodied hands. Needless to say, animal welfare is one of the biggest social issues that the world is facing today. And the mistreatment, abuse and killing of these innocent horses is right up there and in full view of the public eye. This is a cruelty circus, and death camp. Equally disgusting is that our state level governments rubber stamp the endless money pit by handing out tax breaks, casino money, and/or billions in wagering money via the Interstate Horse Racing Act. There is little oversight while billions in wagering is being transferred over state lines, and probably countries as well. 1. Decoupling. Shut-off the millions in casino money transferred to the horse racing industry. 2. Cancel the Interstate Horse Racing Act. This Act was supposed to be temporary to throw a lifeline out to this dying industry years ago. It still continues to this day. 3. Don’t watch or wager on horse races. I sure hope that everyone connected to horse racing will start paying attention to all the injuries/deaths that befall these magnificent creatures. The problem doesn’t begin and end with the owner, trainer and Jockey, but with anyone associated with them, including gamblers. Money talks, and maybe the powers that be would clean up their act. The fines/suspensions should be higher, and each and every state need to follow the same laws, and not make up their own rules. Georgie, most participants, and supporters of horse racing are well aware of the deaths. They choose to deliberately ignore them and live the delusion that all is well. That said, blogs such as this educate gamblers by showing them what they are supporting. There should only be one law, and that’s to make sure this industry dies just like all the racehorses dying in the dirt for $2. The dying is just one aspect of many. There are so many other mandatory entities such as whipping/beating, doping, and dumping that are all part of this antiquated business model. It’s a cruelty circus, and death camp. Don’t gamble on horse races. Gamble at casinos not racinos. I had been in this industry a long time. At no point, do I think that racehorse deaths and injuries are or will slow down. This industry has done very little to improve anything for it’s athletes. Instead they try harder to cover up and downplay the cruelty involved. A trainer with a bad test…a joke. The racing stable will just continue on in another trainers name, while that trainer serves ruled off days. And everyone knows this. From the stewards, vets, and racing office. So, if a trainer cannot honestly serve days for drug violations, than any ruling for violations is just a sham, and useless protocol. If they tried as hard to clean up their act, as they do fighting for ‘millions’ of dollars in subsidies and handouts, well that would be something. But no, they would rather award trainers like assumen, because hey…Nehro never meant a damn thing to anyone in the racing industry. Thanks so much for your comments 20+ Insider. I truly believe that the powerful drug cocktails combined with Lasix have actually BRED unsoundness into the breed. We have the entire racing community dominated by these Trainers: Steve Asmussen, Todd Pletcher, Bob Baffert, Doug O’Neill, who all have multiple drug violations, and catastrophic breakdowns. It’s a despicable industry from start to finish. It not only cons the wagering public, but it also cons our governments into rubber stamping their never ending money trough year in and year out. While billions of dollars are made in wagering, billions given to the associations from casino money, little or nothing is done to improve the situation for racehorses – totally agree with this one. They know that in order to improve their lives they would have to eliminate drugs and definitely eliminate Lasix on race day. They wont do this because they know it will affect their bottom line which is wagering profit. No matter which way you slice the cake, this business is based on the exploitation of the racehorse, and they will do whatever is necessary to keep them training, and running. Doping cocktails have become a mandatory necessity in order to keep racehorses running to fill wagering profits resulting in many deaths. This despicable industry is nothing but a cruelty circus, death camp, and corrupt corridor that needs to be shut down by ending their money supply. 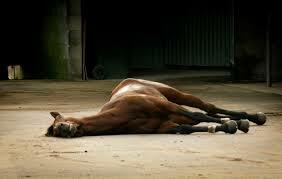 I feel so sad for the racehorse who is nothing more than a disposable commodity after it’s exploited. There is no amount of jobs that is worth racehorses dying in the dirt, or in a slaughterhouse contributing to the environmental disaster that these slaughterhouses are. There just is no place for this antiquated business model in our so called civilized society. Thank you Gina. And yes…decouple and educate. Most people do not support the subsidies and handouts, when the money could be put towards better use for all people, such as education. But most people are unaware of the cruelty, abuse, and drug cheating that goes on in this industry. Horseracingwrongs is changing that. Yes it is changing 20yr+. They are now aware of the daily deaths as well. Anybody who participates, and supports this industry is an accessory to killing racehorses as far as I’m concerned. Along with Gina, you just say it so well, 20yr+industry insider – so much appreciate your input and selfless contribution to raising awareness of what really goes on with these horses. Whipping/beating a racehorses when it’s most likely tired, and/or sore is one of the contributing factors to catastrophic breakdowns. It doesn’t necessarily refer to one particular race, it could be, but it also refers to the incessant repetitive beating/whipping of a racehorse in all of its races. The racehorse becomes psychological fearful of the whip, and won’t protect itself. Instead, it will keep running on a sore limb that can often become a broken limb resulting in a catastrophic breakdown or career ending injury. As most of us now know, California recently INCREASED the number of times a racehorse can be whipped. This supports blatant animal cruelty. I just can’t believe that this is allowed to continue in such an animal loving state as California. It will take a lawsuit to stop this, and their continual denial of providing the deaths of racehorses on their tracks when requested through the FOIA. This is blatant denial of First Amendment Rights. They will keep on doing it until somebody holds them accountable in court. They fail in the court of public opinion though. Consider the example of Jockey Silvestre de Sousa who was handed an 18-day ban, with six day deferred. He repeatedly beat a racehorse and 6 days was immediately removed from the 18 day ban ordered. Talk about a joke. It’s important to note that this jockey had beaten horses 5 previous times within 6 months resulting in fines that rarely increased in monetary value and/or days suspended. The industry claimed that the 18 day suspension was severe for just whipping a horse. No kidding! How much worse can this industry get? The necessary hallmarks to operate in this industry are: whipping/beating, doping, dumping, and dying. Folks, it doesn’t get much worse than this. We can do better than this as a society. It’s time to shut down this antiquated business model. Support decoupling. Don’t gamble at racinos. Don’t watch or wager on horse racing. Educate.